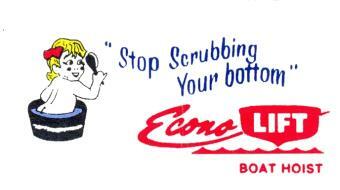 Since 1984, Econo Lift has been providing quality boat lifts at a fair price. 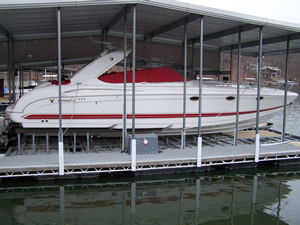 They strive to treat their customers the same way we would expect to be treated if we were buying a boat lift. Let us add you to their Nationwide list of satisfied customers, you'll be glad you did!. 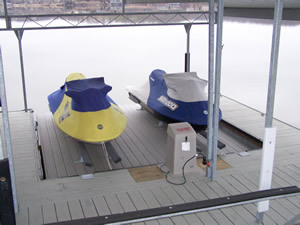 Econo Lift uses only the highest quality materials in it's boat hoists. They use a totally enclosed polyethylene tank for more stability in open or high traffic water situations and durable, completely galvanized metal parts. That's why the Econo Lift boat hoist is the most dependable, yet affordable boat hoist available today. They also offer a rough water kit that minimizes lift movement in your dock to help aid the life and reduce the noise of your lift. 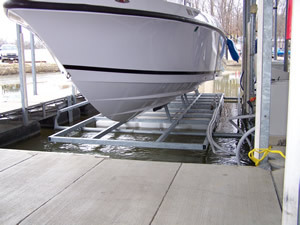 Also available is a front mounted lift where attaching to the sides of the boat slip is not possible. From PWC's to Cruisers, Econo Lift can keep it up for you! 1. Rotomolded Polyethylene tanks that are totally enclosed and carry a lifetime warranty to the original purchaser. 2. US Steel that has been hot dip galvanized to make your boat lift purchase a lasting investment. 3. Poly (UMHW) bushings in arms. 4. Lockable deck mounted control boxes for security and ease of operation. 5. A safety valve mounted in the tank to help secure your lift when you're not around. 6. A ground fault interrupter for your protection against electrocution. 7. Service after the sale, we treat you like we want to treated ourselves. 8. Over 25 years of experience.